Picture caption, left to right: Tom Bell, Nathan Whitley and Adam Piggford. Kielder Waterside Park in Northumberland has been named the best in the UK by one of the world’s leading holiday companies. The Park, on the banks of Kielder Water, was named the UK’s Best Go Active Park at the Hoseasons and Wyndham Worldwide Go Active Conference. 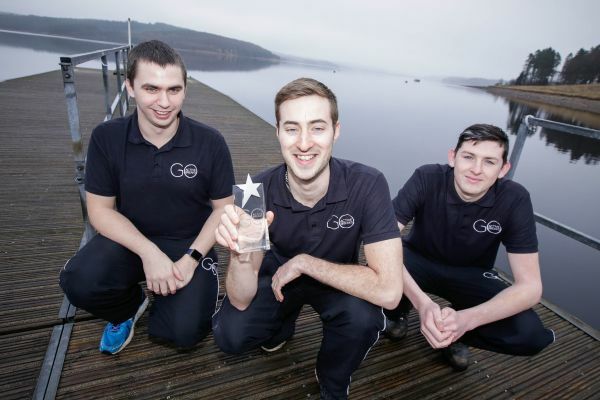 The award marked a double success for Northumbrian Water, which owns Kielder Waterside Park, with the site’s Activities Assistant Nathan Whitley taking the title of Best New Instructor in the UK. Rebranded last year from Leaplish Waterside Park, the site adds the awards to a string of accolades in recent years, with recognition including the Hoseasons and Wyndham Worldwide Award for Outstanding Customer Service and Product Excellence (Diamond Award) in 2014, 2015 and 2016. 2017 will see the opening of a new collection of luxury accommodation at Kielder Waterside Park, taking the number of lodges on site to 50, increasing the capacity for tourists to stay and experience Kielder Water & Forest Park, as well as enhancing the quality of the visit for visitors. Kielder Waterside Park has also won a number of North East Tourism Awards, including Holiday Park/Accommodation of the Year in 2015 and 2016, six Gold Awards in the David Bellamy Conservation Awards, and multiple awards from Visit England. David Hall, Head of Leisure at Northumbrian Water, said: “I could not be more proud of the way our team and the Kielder Waterside Park site have developed in recent years to reach the market-leading position that is reflected by these awards. We are all very pleased about Nathan’s award, which is a fitting reward for his exceptional efforts. Mark Warnes, Property & Portfolio Director at Hoseasons said: “Kielder Waterside really is a fantastic short break destination for families who want to get active and try their hand at something new.